Studies consistently show that the gender pay gap is real. Even in IT, where the need for verifiable skills and a time honored belief in meritocracy should help level the playing field, women take home less pay than men. But a strange thing happens when accounting for the exact same education, experience, job title and industry: the pay gap disappears. Men and women with similar backgrounds in similar roles get paid the same. In the fall of 2015, PayScale released a massive compensation study that tracked more than 1.4 million full-time employees over a two-year period. The findings were depressing, but not surprising: Women make less than men in every industry and job, though the wage gap is much narrower in IT than elsewhere. Dice.com’s annual salary survey report echoed these findings in 2016 — with a twist. The survey, which measured the compensation levels and types of jobs held by men and women in IT, found that when comparing equal titles, experience, and education, men and women in technology are paid equally, a finding that has been consistent since Dice.com’s 2009 salary survey. So what gives? Is there a gender pay gap in tech or not? According to Dice, IT suffers from a “position gap,” as previous Dice research has shown that women and men tend to hold different positions within IT, accounting for the differences in pay. Whether this is by choice or because of a systemic, institutional bias is the million-dollar question that no study has successfully answered, Melland said. Katie Bardaro, lead economist for PayScale, said PayScale’s data concurs: There is a greater number of men in architecture, programming, and development jobs while women gravitate toward project management, administration, and other ‘softer’ areas, she said. She speculated that it could be that those positions have a more predictable, 9-to-5, five-days-a-week schedule that’s easier to plan around. “There’s a lack of flexibility in some of the harder, architecture and development, programming and coding jobs,” Bardaro said. “Many of these jobs require 24-hours-a-day, 7-days-a-week, on-call availability that, if you have a family, if you’re juggling other responsibilities as women usually are, they can’t accommodate. So, it’s not a wage gap that’s the problem, it’s a jobs gap,” Bardaro said. PayScale’s 2015 report looked at 150 tech-specific job titles and found that once the data was controlled for compensable factors like education, experience, and job responsibilities, discrepancies in pay aren’t significant, if they exist at all, especially in tech. Yet, a major disconnect shows up in more recent research. Hired’s 2018 State of Wage Inequality report finds an 8 percent gender wage gap for technical roles. 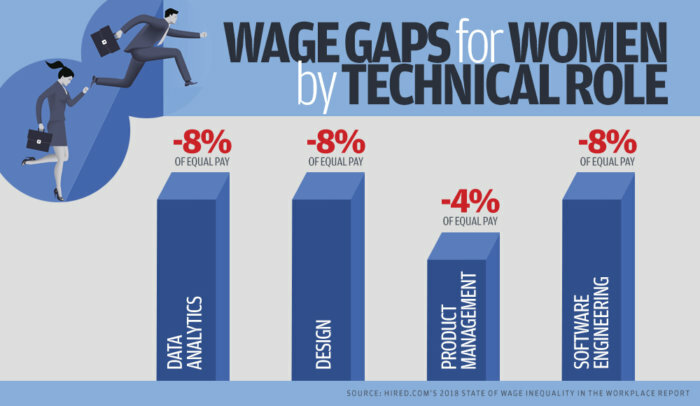 When considering technology positions, including data analytics, design, product management and software engineering, product management’s wage gap is only 4 percent, half that of the other positions, according to the Hired research. Though that’s much narrower than the average 20 percent across all industries, it’s still a gap. And Visier’s Gender Equity Update research shows the same phenomenon. Before age 40, the research shows, women are less likely to be promoted than their male peers, but after 40 they are promoted at a higher rate. Research also shows that, as women enter traditionally male-dominated fields, wages in those fields decline across the board. The lesson for companies, Sutcliffe says, is to go beyond equal pay for equal work — which is a great place to start — and expand efforts to include succession planning, promotions, equitable leave policies and rooting out biases that could deter women from taking technical roles and leadership roles. “You need to look at your culture and enact policies that will help women stay in the workforce in the first place, but also determine whether or not your promotions criteria, your leave policies, your leadership progressions are equitable, too,” she says. Rectifying the gender wage gap at your own company is a fairly easy issue to solve, and it can help with attracting and retaining IT talent — women technologists, especially. In fact, two out of five women say equal pay is their top workplace wish — and that’s critical for CIOs who want to hire and retain women technologists. In 2016, Jeff Weber, the senior VP of people and places at enterprise learning and training software company Instructure, authored a survey that polled more than 1,000 working men and women across the U.S. The results revealed that equal pay is the issue most women want, and the one both women and men most expect to change by 2020. And that might not just be optimism. Increasing awareness of the issue of gender pay inequity, especially in IT, where companies struggle to attract, hire and retain talent, will likely put pressure on the issue. Companies such as Salesforce, Intel and Adobe have undertaken highly publicized moves to correct pay inequalities in their workforce. And social movements like #MeToo and #TimesUp are taking the push for equity even further. There are segments of the industry in which women are consistently paid more than men; data center careers, for instance. Data center software company Stratoscale released the results of its first biannual Data Center Professionals Salary Survey, which polled 314 data center professionals globally in February 2016, and found that women in the data center consistently earned more than men — on average, and regardless of role, as much as 17 percent more. The survey also revealed that data center professionals are pretty well compensated, with salaries between $100,000 and $140,000. Some companies are embracing radical pay transparency to help eliminate the wage gap. Buffer, for example, makes its salary information, and the formula it uses to calculate pay rates, publicly available. Microsoft, Pinterest and real-estate website Redfin, as well as Instructure and Hired, have performed pay audits to ensure pay is equal. Ensuring pay is equal and making sure your culture supports equity and parity are critical to attracting and retaining IT talent — and it’s an issue you address immediately. No need to wait until 2020.